The bazaar remains a true Bazaar of the Bizarre, open to the public with free admission, and showcasing a wide variety of independent artists, designers, and crafters. All handmade and all Canadian made. Come hang out, talk to artists, listen to the DJ’s, try on things and have fun with like minded weirdos! FREE for the public to attend! Come out and check out a great day with Vendors, music, friends, and fun. This is our 12th year and we hope you can join us once again or for the first time. The Bazaar of the Bizarre brings you arts, fashion and crafts that are : different, interesting, weird, strange, one of a kind, macabre, whimsical or just things to flip your brain out! All handmade ALL CANADIAN! Full on with entertaining freaks, dancers, tarot readers and other oddities! Join Witchdoctor Utu, Rev. Terrie Brookins and Cat Thagard for a unique weekend of Root Work and Conjure featuring interactive ceremonies, hands on classes and formula, exclusive vendors and readers in Niagara Falls Ontario; the Gateway to Freedom. First 50 attendees get a Wellness Swag Bag! The Holistic Healing Fairs were created to educate and inspire our local community to become more conscious of their daily habits. A place where everyone is welcome, judgment free. Come explore the many unique ways of healing – art expression, your own jewelry piece, a chemical free body lotion and so much more. All of our sponsors and vendors have the same outlook on life, to help make the world a better place. Come spend the day with us sharing helpful ideas, try something different and learn about the local amazing businesses right in your back yard. Join us on Facebook LIVE! We’ll answer questions, talk about our upcoming events and more! Be sure to sign up for the Beaux Magique spam free newsletter, find us on Facebook, Instagram , Google Plus, Pinterest, Tumblr, or follow us on Twitter! 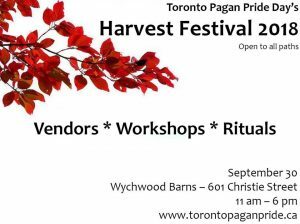 Join us for rituals, workshops, shopping from our vendors, and meeting other pagans on Sun Sep 30, 2018 at TPPD’s Harvest Festival at Wychwood Barns! We are building on the success of the 2017 festival offering park space, covered space, and indoor space. We`ll keep The Stop barn (barn 4) and we’ve expanded the space we`ll use to include the covered street barn (barn 3). We’ll also expand our vendors to include some food vendors this year. 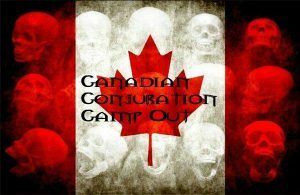 This is a private and invitation only event held by Utu Witchdoctor of The Dragon Ritual Drummers. If you’ve been invited and will be at this event, please submit your pre orders ASAP. The theme of Kaleidoscope 2018 is “Cosmos”. We live our lives as networks of energy bound together as particles and waves, knitted into the conscious form of a being, that is itself in a complex dance with other beings; spreading out into an untold vastness of substance, through time, into nothingness with form. At this Kaleidoscope we reflect on our place in the Universe, as scientific fact and as poetic observation, as traditional knowledge and as emotional reaction. The Kaleidoscope Gathering is a festival put on by its participants. “Everyone has something to learn, everyone has something to share.” It is by teaching too that the best learning is done. What does your favoured mythology say about how the cosmos is arranged? How was it formed? What art or craft says “outer space” or “the stars” most to you? Does life exist “out there” in the vastness of space? What is humanity’s interactions with them, here on earth? What ritual tool can we fashion to best connect with the cosmos? What building blocks of reality are used in your spiritual tradition? Is it elements, atoms, energy, chi, prana, vril? What is this substance of the cosmos and how does it work? How do the stars and planets influence our lives? How does consciousness exist past the human mind? In animals, plants, the ‘inanimate’, ecosystems, the Earth, the gods? What symbol best represents the cosmos? Why, and how is it used? What is the difference between ourselves, aliens, spirits, supernatural beings, the Other, or the Gods? What stories and myths are written in the night sky? How do we travel to other places in the cosmos without a rocket ship? What will be the future of Paganism, when humanity begins to have societies living on other plants?